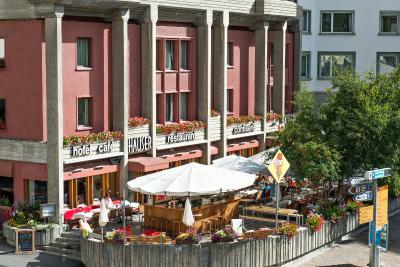 Lock in a great price for Hauser Swiss Quality Hotel – rated 8.9 by recent guests! Hotel is centrally located, room with front facing balcony with great views, all clean, good bathroom with hot shower/bath. good restaurant @ reasonable prices, has patisseries, ample free local drinking water, free shuttle from and to train station, everything can be reached by foot. Very friendly staff and excellent restaurant. Location is very convenient. The only thing I liked about the Hauser was the location and the pastry shop next to the restaurant. Room is furnished with local pine and larch wood. Free upgrade to a much bigger room. Staff is very friendly and helpful. Restaurant downstairs has good varieties, and reasonably priced. Shuttle severe to/from the train station is very convenient. Staff was great, wonderful lady at check in actually loaned us umbrellas, and her own sweater for my wife, as we weren’t prepared for the unexpected rain and cooler weather! Location is in the middle of incredible fashion shops, with easy access to the lakefront. Breakfast and Dinner at their restaurant was excellent. Incredible Staff, Hotel and Restaurant!! Phenomenal location and panoramic view from upper level room. 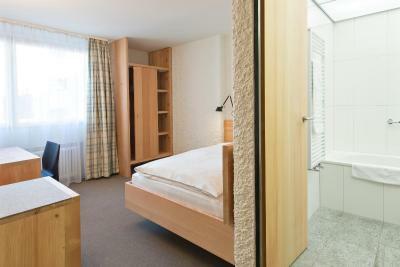 Wonderful natural wood finishes in room. Ask for special pillows gladly delivered upon request. Delicious breakfast with outdoor deck and bar. We booked the economy double room and they were able to separate the beds by a good meter...many of the other hotels were unable to do that. The room was large. We had the view of the square below with mts. in the background. Excellent restaurant with its own bakery. The stay was a night at both ends of the trip on the Glacier Express to Zermatt. There was a free shuttle to and from the bahnhof. We parked our car in the covered garage across the street for 20 CHF a day. They stored our extra suitcases while we were gone. Staff was very friendly. Good WiFi connection. Room was clean and maintained. They gave us a room with a terrace which was excellent. Bed was very comfortable. Breakfast selection was great. Free shuttle from the train station to the hotel, vice versa. I thought it was extremely thoughtful to pick the guests up from the train station. It was a welcome surprise especially since it was raining and we had no idea where the hotel was located. Also many thanks for the ride back to the station in the morning! 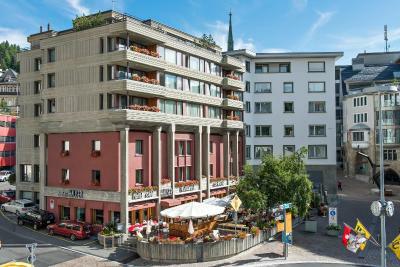 Hauser Swiss Quality Hotel This rating is a reflection of how the property compares to the industry standard when it comes to price, facilities and services available. It's based on a self-evaluation by the property. Use this rating to help choose your stay! The smoke-free Hotel Hauser can be found in the heart of St. Moritz close to the famous boutiques, such as Bucherer, Armani, Bogner, Versace and many more. The cable car to the ski pistes can also be reached on foot in 5 minutes. 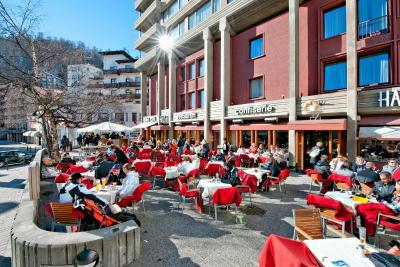 The Hotel Hauser has been run by the Hauser family since 1955, and became famous due to its fine home-made confectionery and desserts, and especially for its Engadine Nusstorte (nut and caramel pie), available at the hotel shop. Renovated in 2013/2014, all rooms have an IP TV offering 130 channels and video on demand. 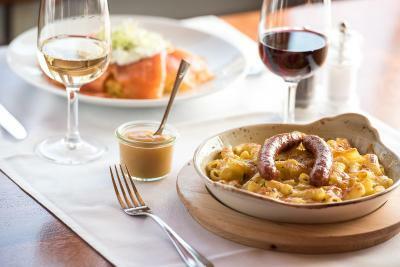 To add to the culinary delights, The hotel offers a restaurant serving local, regional and international cuisine, a spacious terrace, the RooBar and an in-house confectionery. 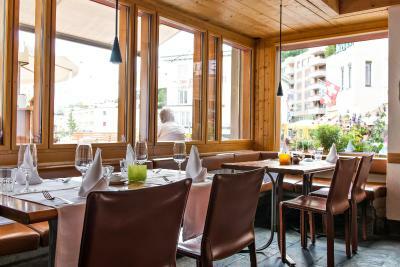 This is our guests' favorite part of St. Moritz, according to independent reviews. 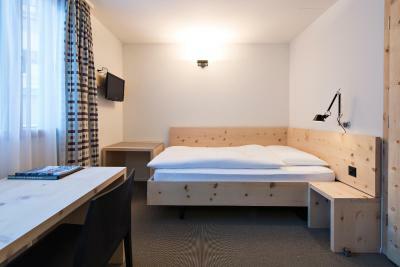 When would you like to stay at Hauser Swiss Quality Hotel? Renovated in 2013/14, these functional rooms are on the north or west side of the building. The furniture is made of wood from the local forests. 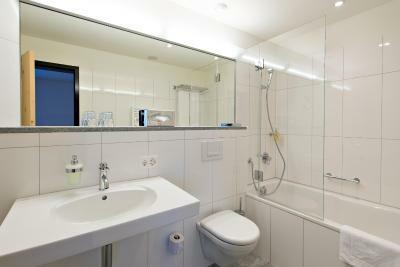 A bright bathroom, furnished with Bergeller granite tiles, comes with a shower or a bathtub. Public parking is available on site (reservation is needed) and costs CHF 10 per day. This spacious, south-facing room was renovated in 2013. It has wood furniture, a sitting area, a TV, a work station and a bathroom made of Bergeller granite with a shower or a bathtub. 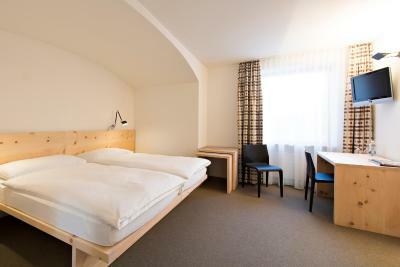 Renovated in 2013/14, this spacious room with a mountain view comes with a work station and has a bathroom with a bathtub. 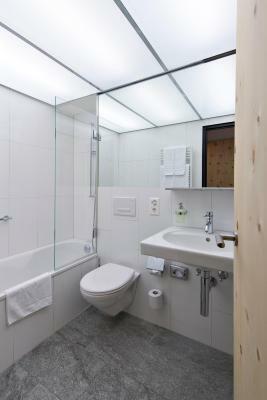 This room was renovated in 2013 and has a TV, a desk and a granite bathroom with a shower or bathtub. The furniture is made of wood from the local forests. Renovated in 2013/14, this room features functional furnishings from local materials and a bathroom with a bathtub. Renovated in 2013/14, this room has space, a work station, a sitting area and a bathroom with a bathtub. This room was renovated in 2013 and offers a TV, a desk and a granite bathroom with a shower or a bath tub. The furniture is made of wood from the local forests. Our hotel is in the middle of the town, everything is nearby and our sunny terrace is just for enjoy a lazy afternoon, in summer and also in winter time, with a holding warm homemade Glühwein. House Rules Hauser Swiss Quality Hotel takes special requests – add in the next step! Free! Up to two children from 0 to 6 year stay free of charge for extra beds. 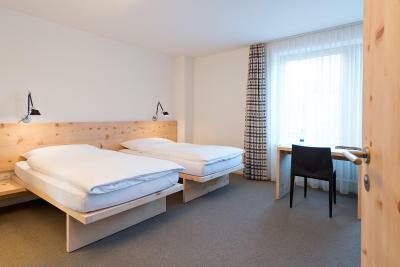 Up to two children from 7 to 12 year are charged CHF 40 per person per night when using existing beds. Hauser Swiss Quality Hotel accepts these cards and reserves the right to temporarily hold an amount prior to arrival. Breakfast was delicious and the hotel was very clean. Just a matter of opinion, out of four beds in the room, two probably could have been higher off the floor. The price per night was a lot higher than usual but I guess it’s because of the White Turf weekend. Perfect location. Wonderful staff and family run hotel, we’ve been coming here for 3+ years and it’s always a great experience - clean rooms, nice breakfast, very professional and kind staff. No way to regulate temperature besides opening and closing windows. However, opening a window would result in lots of noise from the bar downstairs or from neighboring bars. The staff at Hauser were incredibly friendly and helpful. Special mention to Ursula at breakfast- what a treasure! Just thought it was overpriced for what you get, but then - this is St. Moritz. No mini-bar. Staff were incredibly nice to us, super helpful about getting around the town. Room was larger than expected and comfortable. View was great (looking at the roundabout). Right across the street from some basement bars for nightlife. Great food downstairs in their restaurant. Nice staff and a warm welcome. Nice location with very easy access to ski slopes. Location was great, the Hauser cafe and the outside bar was amazing. The food was also great.